We’ve made it to our final destination … Suchitoto! It’s a great little artsy mountain town an hour out from big, smelly San Salvador. 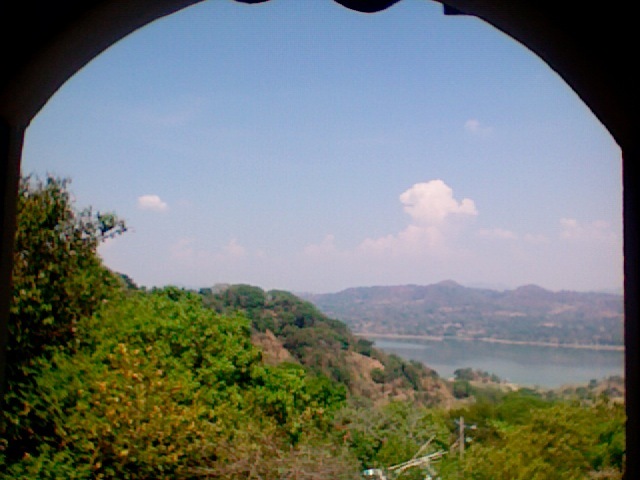 We’re staying in an adobe house perched right at the very edge of a mountain overlooking Lake Suchitlo – La Villa Balanza. It’s at the bottom of the steepest cobblestone hill I’ve ever seen. Ever. The views are crazy and so is the wildlife. Between the roosters, the cicadas, the orioles, the snarling pups and the roving band of drunken men that congregates outside our window each evening, it’s hard to fall asleep before midnight or to stay asleep after 6 a.m. A bat even flew into our room last night! So we’re siesta-ing a lot. View from our room at Villa Balanza, Suchitoto, El Salvador. Tomorrow, we’re going on a horseback ride through the mountains to check out some guerilla camps. Truth told, though, I think Morgan and I are both ready to go home. My belly’s been rumbling again and we’ve both grown tired of the seemingly unending stream of logistical hardships that befall us at every turn. Does that sound grumpy? Hmpf. Something about the five-week mark regularly turns my traveler’s heart weary. Food has been the biggest issue on this trip, no contest, and I’m not even complaining too long or too loudly about our mutual cases of salmonella poisoning, because gastrointestinal distress is pretty much par for the course when you venture into the developing world. Fair enough. What I take hearty issue with is the service itself. Take this morning’s breakfast. Neither Morgan nor I was in a great mood for starters, and I’d already logged two hours of work before we began the hike up the hill to the hotel’s restaurant, which conveniently doesn’t open till after 9 a.m. On the way up, we got into an argument about whether the kitchen’s water was filtered and drinkable – the girl we asked said yes but I was concerned she hadn’t understood the question, as I’ve noticed “yeses” and “nos” around here don’t mean quite the same thing they do at home, and are, instead, approximations. My breakfast was passable – it’s hard to screw up scrambled eggs and beans, which is one of the few things I’m eating at this point – but Morgan took one bite of his pancakes and just about turned green. He spit a mouthful of half-chewed cake into a napkin and then by way of explanation dug his fork into the middle of the remainder of the cake. Goo oozed out between the tines. Totally raw in the middle. We semi-politely sent the cakes back, and while the kitchen girl was giving them another go on the obviously not-yet-heated-up grill, a pair of Salvadoran health inspectors walked in for what I can only guess was a random check. Five minutes later, while the inspectors were busily checking expiration dates of bottled beer, the cakes came back. Still raw in the middle. And I’m not talking a little chunky or runny. Totally goo. So we sent them back again. The staff seemed super annoyed, perhaps partially on account of the inspectors’ presence, and Morgan was pretty much fuming. I told them we didn’t even want the nasty cakes anymore (less politely, but still politely enough). A few minutes later, they landed back on the table yet again, looking rather tattered by this time after their third round on the grill, but still oozing batter. At that point, we ditched the whole project and headed out the door. I could tell the proprietor was offended. Feeling mutual. I recognize that there are different standards of service in different parts of the world, and I’ve learned after these many years of travel to leave my North American expectations of quality and cleanliness at home. But it ain’t easy, especially when the problem seems to be people just not trying. We’ve had similar issues pretty much everywhere we’ve gone, and at this point, eating is less a pleasure than a pain, which is saying something considering how much I love food! Everything takes an hour, even if you’re the only customer. And half the time it’s not even what you ordered. Or there will be random hunks of raw potato or beef or what-have-you just hanging out in the food for no discernible reason. Or the chef will switch out the listed sides for whatever is already cooked up and ready to go. Or the server will tell you they’re out of 2/3rds of the menu items and you can’t help but suspect that they just don’t feel like making them. Or a place will close early on whim. And the worst-best part is if you peek through any given kitchen’s door, you’ll often see like a zillion people working in said kitchen, and yet they STILL can’t get the food out quickly or correctly. For every 10 kitchen workers, two will be hugging, three will be texting, a few more will be chatting and joking and wrestling and maybe one or two will actually be cooking or cleaning. It is, indeed, hard to reprogram your standards. During my year in Mexico, I became deeply, intimately aware of the fact that we North Americans all subscribe subconsciously to a Cult of Efficiency. Things must be fast, the credo goes. Things must be pleasing to look upon, and to smell, and to taste. Things must be done correctly, consistently, and with spirited haste. In other parts of the world, abstractions such as Relationships and Relaxation and Mutual Accommodation are prized over speed and service. Time is less linear than circular. An hour is less a standard unit of measure than a vague marker of an arbitrary hunk of time that’s going to pass you right by anyway, either way, so why stress? And if you didn’t order (and what’s more don’t really care to eat) that pile of food that has just been set lackadaisically before you, well, does it matter all that very much? Have a few mouthfuls of cold, crusty scrambled egg ever sent anyone to his early grave? Couldn’t you suffer through a few rogue potato peels in your margarine-soaked vegetables without coming to any real bodily harm? Won’t a sour, underripe and slightly mangy-looking mango fill your belly just as well as its sweet, yellow brethren? In theory, yes. In practice, No. No it will not. Maybe if the prices weren’t so high and the expectation of a generous tip so unabashed, I’d feel more charitable. Maybe I just have a lot more evolving to do. Probably a little – or a lot – of both. With that, I’m off to hunt down some lunch from the downstairs fridge. Soggy, salty, pizza leftovers here I come, if the proprietor’s son hasn’t eaten them, that is. He’s got a nasty reputation in these parts for just such offenses. Oh, and a Virtual PS to whoever stole the two pairs of underwear I left hanging on my windowsill: Really? You’re welcome. I think.